From the very moment your man slips that ring on to your finger and you become a “Bride-to-be” everything that is routine and normal gets put on the back burner, because girl, you have a wedding to plan!!! It’s amazing to me how instantaneously we brides become obsessed with every little detail; from the dress to the venue, the food and of course…the flowers! Now, I hate to generalize because of course not all brides are the same. In fact some are more than happy to let the family matriarch take matters into their own hands when it comes to each and every minute detail. That was not me. I was (as always) a control freak through-and-through from day one of my engagement to the last possible second when I was forced to go and get ready to march down the aisle. The reason for my eight month long overly controlling, slightly obsessive behavior was my vision. Yes, I had a very particular vision of what I wanted our wedding day to look like, and I knew with a little tenacity and some seriously talented people…my vision could be made a reality. And it was! 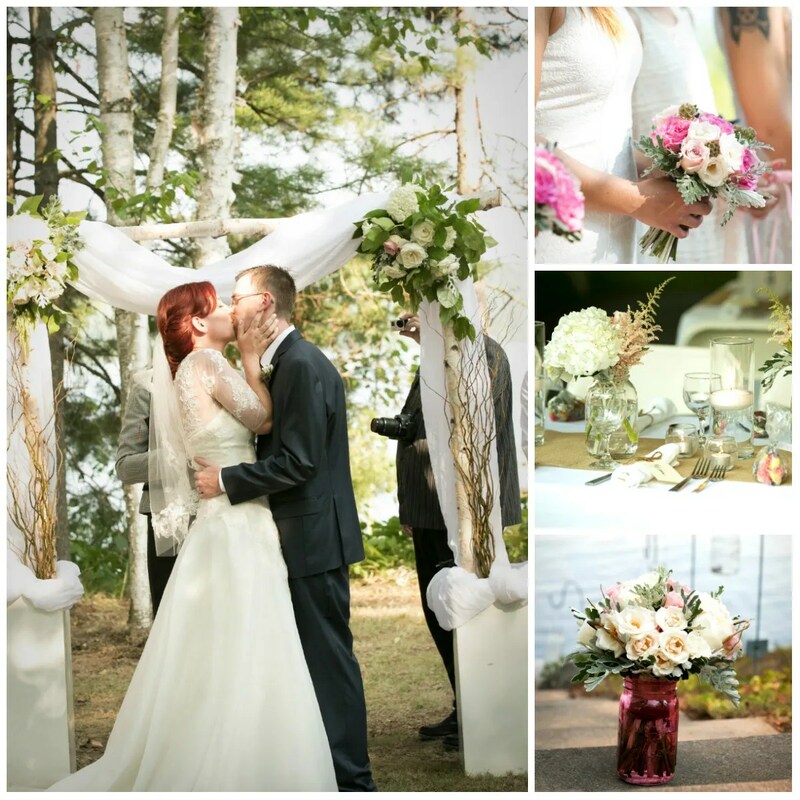 We chose my family cottage in Barry’s Bay, Ontario as our venue. 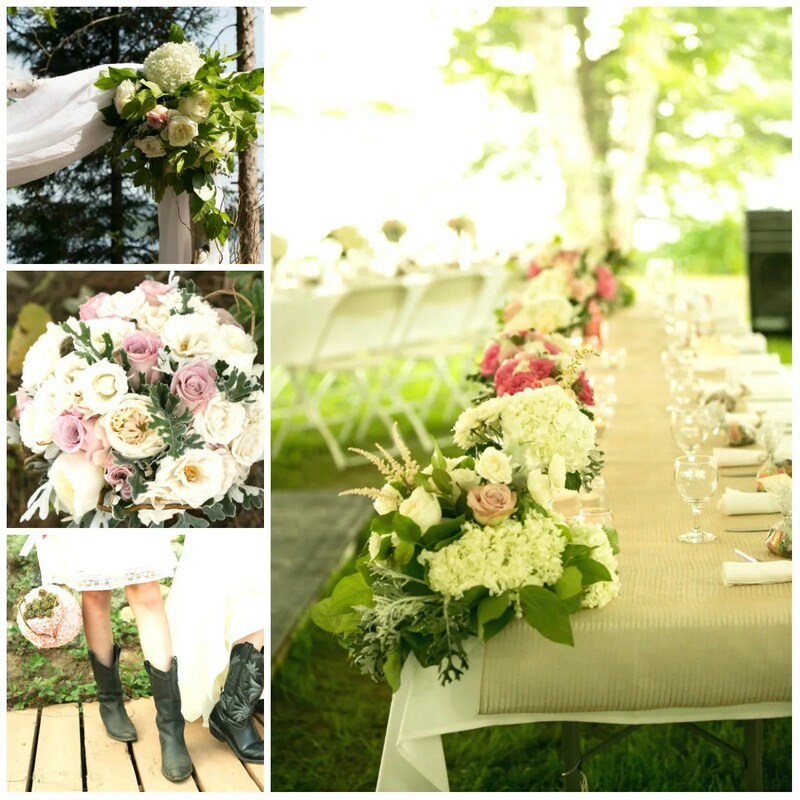 Our thought was to have a small, intimate, rustic wedding nestled between the trees and the lake. Something romantic and beautiful that wouldn’t take much work to make it the day of our dreams! Sounds awesome right? It was! However; to think that a wedding on your own property (no matter how intimate) is going to be less work…WRONG! Far more work than we thought or hoped, but the results were absolutely breathtaking. We had a real live “Pinterest-style” wedding, complete with glowing mason jars hanging on shepherd’s hooks, the burlap runners that adorned our tables were scattered with tea lights, various sizes of floating candles in vases and more mason jars which were filled with white hydrangeas and the most beautiful dusty pink garden roses you have ever seen. It was perfection. My color scheme was vague, but I knew I really wanted that rustic, soft, romantic look. As I work with a fantastic florist I figured I would bring my ideas to her and she would tell me what to do. I had seen her do exactly that time and time again with the multitude of brides that flow through her shop. I was to be no different. I booked my consultation and away we went. Or shall I say, away SHE went. It was incredible! She took my vague description of what I wanted and turned it into THE PLAN! From the positioning of the aisle, to the design of the Archway, how many tables and how long they should be, how they should be set, she even stressed the importance of having an abundance of bug spray available to our guests. This girl knows her stuff! She didn’t take over, she inspired. Not only did she inspire my vision, but she was a huge part in bringing it to life. She and my flowers rolled into the driveway of my cottage at noon. After a three hour drive from Ottawa, she stepped out of the truck in heels and a dress and immediately got to work. By 3pm, there wasn’t a detail she had not attended to or a flower out of place. She had built the archway with white birch and curly willow, draped it with organza and decorated it with the most breathtaking clusters of hydrangeas, garden roses, spray roses and more curly willow. She had scattered the aisle with white rose petals, made all the table centerpieces, set all the tables and made sure each and every candle was lit. As if that were not enough, the bouquets were then hand delivered to myself and my maids. They were stunning! Exactly what I had pictured. Made with so much care. She made sure each bridesmaid had their bouquet, that the flower girl had her pomander ball (so cute) and then she turned me around, zipped my dress, straightened my veil and handed me my bridal bouquet and sent us on our way. As the sunset over the lake and the tent came alive with the glow of tea-lit mason jars and the subtle scent of garden roses in the late-summer air, I remember looking around at everything and everyone and thinking “this is what a dream come true feels like”. What a wonderfully descriptive post about your big day Caity ! I loved reading what you wrote, right down to the tabletop runners, the colours of everything, the tea lights and the love with which it was all prepared for you. I was able to visualize it all as I read to the end. I personally know Flowerstalk and couldn’t agree more about their high standards, their professionalism and their dedication to perfection. Hopefully, other new brides will take time to read and they too will be ultimately satisfied on their wedding day !